What a rollercoaster life is, eh? From the bumps, highs, lows, scary parts, exciting parts, times where you are waiting and waiting just to get in the car, disappointments, aggravations, thrill, dread and anticipation, that feeling — once you’ve committed yourself and are strapped in, climbing the big hill, listening to the loud clanking of the chain pulling you away from the safe and familiar — wondering, “What was I thinking? Will I survive this?” And the joy and sense of being alive, spurring you on to the next experience. It’s nowhere near as much fun going on the ride alone — you need to experience it with your friends. The problem is, when you are on the ride, everything is a blur. It’s not until you get off that you have time to compare notes about what you just experienced. Life is kind of like that, too. I am so grateful for my friends who are accompanying me on this ride. At the same time, we are busy, busy, busy and there’s never enough time to spare with any of them. We just catch glances, as it were. Heaven, then, will be the time where — after the ride — we can spend time together, talking about the experience and how grateful we are that our friends were on the ride with us. Next Where Do I Write? 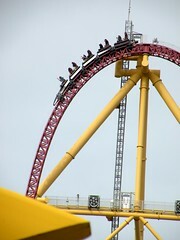 I LOVE THE TOP THRILL DRAGSTER :). Good post, the first thing i noticed before i started reading was the photo. Gotta love Cedar Point!